Empowering clients to choose the food items they prefer in a space where a variety of healthy options are available and promoted. Think about how your food pantry distributes food. How long do people wait? Do they wait outside in the cold? Can they pick up and choose the food they want? Is healthy food available at your pantry? The key areas of wait time, display and food quality are the most important elements of a healthy client choice pantry. The goal is shorter more respectful wait time at the pantry, the ability for clients to choose the food they prefer, and the availability of high quality, healthy food options. The choice continuum below describes 5 levels for providing choice. If your food pantry is at a level 1 or 2, resources are available to help convert your pantry to healthy client choice. At level 3 your pantry is at the beginning stages of client choice. The goal is for pantries to reach a level 5. Why is Healthy Client Choice Important to Your Clients? 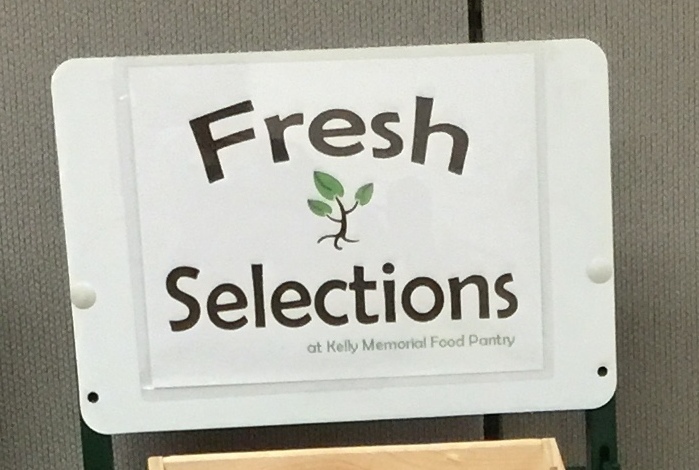 A client-choice food pantry enables members to choose their own food like they would at a grocery store, rather than having bags of food pre-packaged for them by pantry staff. When clients can choose their own food it creates an atmosphere of respect and builds trust between clients, staff and volunteers. Research shows that people who visit food pantries have high rates of food-related health problems, including diabetes, high blood pressure, high cholesterol and obesity. Therefore, it is critical that the "charitable" food provided at food pantries should be of high nutritional quality. How Does Client Choice Benefit a Pantry? When pantries convert to a healthy client choice model, the emphasis should be on displaying and promoting healthy food items in a dignified and attractive manner. Staff should ask themselves, "would I want to select this food for my family?" In our Resource Center, we provide tools and materials for setting up a healthy client choice pantry. Fresh food can be stored in open bins inside a grocery produce cooler. Dairy and other refrigerated items should be stored in refrigerators, and frozen items and meats in a similar freezer. Shelf-stable items can be displayed on open, rolling shelving units. Using colorful signage to promote healthier items in your pantry makes the healthy options more attractive. Researchers at the University of Saint Joseph are developing a stoplight nutrition ranking system called SWAP – Supporting Wellness at Pantries. The SWAP System is designed to empower food banks, food pantries and clients to make more informed decisions when selecting charitable food to support health. The SWAP System takes out the guesswork and provides specific guidelines for saturated fat, sodium and sugar for each food group. Using the 2015 Dietary Guidelines, the SWAP System ranks foods into green (choose frequently), yellow (choose sometimes), and red (choose rarely). More information about the SWAP System is available in the Resource Center.